Science reports on the startling increase in life expectancy in southern Africa accomplished through programs that supplied highly active antiretroviral therapy (HAART) to HIV-infected residents. This began in 2004 (see Figure). Since then, life expectancy at age 15 for the affected countries has increased by more than 10 years. Everyone: please stop what you are doing and express gratitude, in what ever way works for you, for this wonderful accomplishment. There are also lessons here for science and policy. HAART is a complex regimen of antiretroviral drugs. One of the challenges of treating AIDS is that HIV has a short life-cycle and lacks a copy-editing function in its replication, hence it mutates very quickly. To effectively suppress HIV replication, you need to attack it with several anti-retroviral agents. These multiple drugs need to be taken on a complicated schedule. When HAART succeeds it can prevent the development of frank AIDS among the HIV-infected and greatly reduce the risk of HIV transmission. Using data from a population cohort of over 101,000 individuals in rural KwaZulu-Natal, South Africa, we measured changes in adult life expectancy for 2000–2011. In 2003, the year before ART became available in the public-sector health system, adult life expectancy was 49.2 years; by 2011, adult life expectancy had increased to 60.5 years—an 11.3-year gain… Conditional on survival to 15 years, the median length of life was 42.6 years in 2003 and 60.7 years in 2011… Between 2003 and 2011, all-cause mortality declined by over 50% for adults aged 25 to 44. 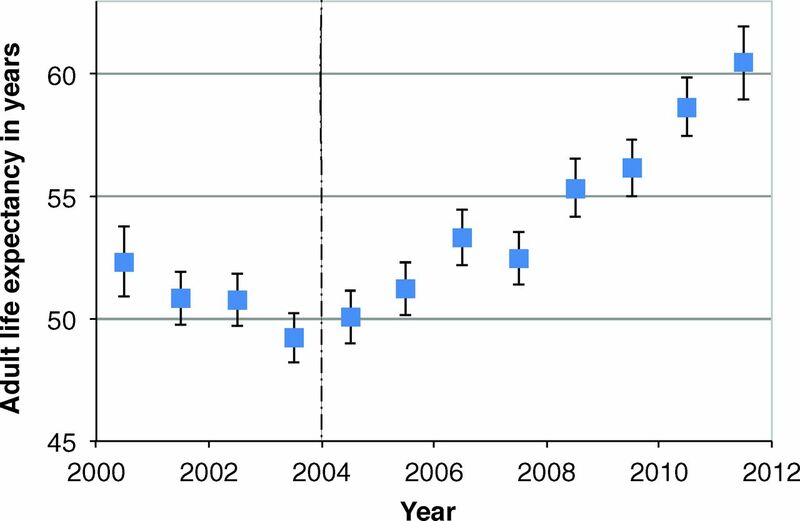 Given that life expectancy probably would have continued to decline below 2003 levels in the absence of ART, the 2003 mortality rates provide a conservative counterfactual… Discounting both costs and effects at 3%, the cost-effectiveness ratio (CER) was $1593 per life year saved, less than a quarter of South Africa’s 2011 per-capita gross national income (GNI). Interventions with CERs less than per-capita GNI, a standard lower bound on the monetary valuation of a life year, are considered very cost-effective. The South African GDP per capita is ~$11K. If we valued lives in terms of North American or West European GDP per capita, the cost-effectiveness ratio would be four to five times better. The mass provision of HAART over a large population in southern Africa has produced tens of thousands of years of saved lives, at a very reasonable cost. It’s the best thing that has happened, so far, in this century. So how can we succeed like this again? There are two big lessons. First, despite what you have heard, aid to developing countries can improve the well-being of their citizens. The provision of these medicines was supported in part by the President’s Emergency Plan for AIDS Relief (PEPFAR), the president being George W. Bush. There are controversies concerning PEPFAR, including arguments that there were even more cost-effective ways that the money could have been spent. But although it is useful to benchmark the effects of Southern African HAART against a theoretically optimal allocation of global health resources, we could also benchmark PEPFAR against other ways the US spent resources overseas during this period. Such as the Iraq war. This was a triumph not just for US dollars, but also for the medical communities and peoples of the nations of southern Africa. There had been concerns that that African health systems would be unable to distribute it and that the treatment regimens would be too complicated for local people to carry out. With perhaps a suggestion that the high rates of infection were themselves evidence of a chronic personal irresponsibility that made mass implementation of HAART implausible on its face? But the data show that poor people and poor countries are not always too incompetent to take care of themselves. The second lesson is the importance of science. HAART was possible only because of basic science on retroviruses gave us the tools to understand HIV replication. And it was possible only because of a discovery process involving extensive clinical trials, including expensive failed trials of false hopes. Medical science is largely trial and error learning. There are many failures for each out-of-the-park success like HAART. Because most good ideas fail, you really do have to throw money at medical problems if you want to succeed. Proclaiming the importance of science sounds otiose, because who is against science? The US government, it turns out, which is about to cut funding for basic and clinical science by more than 5%. Ben, that is very kind! Thanks so much.